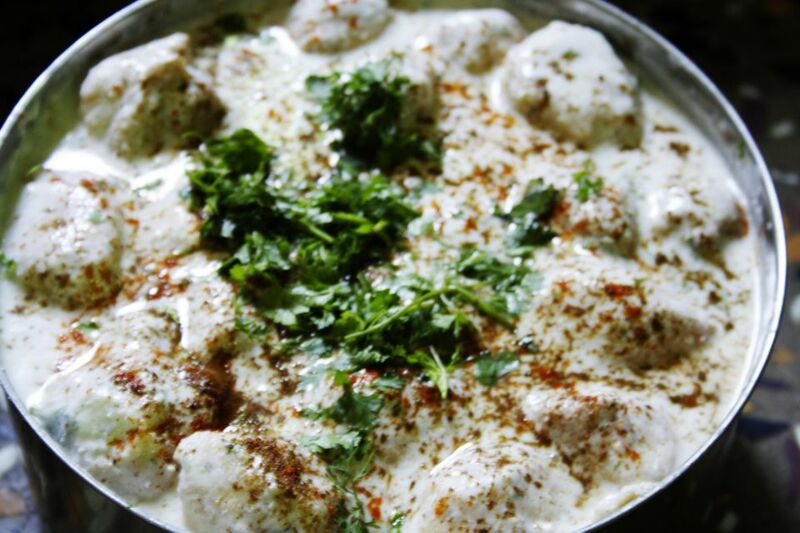 Dahi Vada is North Indian in origin and can just as easily be a main dish on a hot day as it can be the perfect accompaniment to other meat or vegetable dishes on a special occasion. You can also eat it as a snack! While it looks tricky to make, it isn't and the effort you put into preparing it will be worth the delicious result. Soak the urad daal in a bowl of water overnight. Grind it into a paste the next morning. Do not add any water while grinding. Add the green chillies and ginger to this paste. Mix 1 cup of yoghurt with 2 cups of water and salt to taste. Keep aside. In another bowl mix the remaining yoghurt with the red chilli powder, chaat masala, cumin powder, sugar and salt to taste. Mix well. Keep aside. Heat oil for deep frying on a medium flame. Grease your palms with oil and put 1 tbsp of the lentil mix in your palm. Make into a donut shape (these are the vadas). Slide each vada into the hot oil and fry till light golden. Drain and put immediately into the yoghurt/water mix. Allow to soak for 2-3 minutes. Remove from the yoghurt/water mix and press gently between your palms. Arrange these vadas in a deep platter as you prepare them. When all urad daal paste is used up and the the vadas are done as above and in the platter, pour the thick yoghurt mix over them to cover completely. Garnish with chopped coriander leaves and chill in the refrigerator for a few hours before serving. To serve, put 1 or 2 Dahi Vadas in a plate and garnish with Tamarind Chutney and green Mint-coriander Chutney.